Veet Infini'Silk review: is this budget buy any good? The Veet Infini'Silk is a compact, mains-powered home IPL device with an attractive price. It has a skin tone sensor so you can't use it on skin that's too dark. It's very simple to operate and comfortable to use. The bulb flashes will last you around 5 years if you use it for treating smaller areas like bikini line, underarms and forearms. Learn more in the full Veet Infini'Silk review. The Silk’n Glide is available for UK and European customers. You can use it on black, dark brown, brown, dark blonde hair and light to medium skin tones (Fitzpatrick skin types I to IV). You can’t use it on dark brown, brownish black and darker skin tones (Fitzpatrick skin type V to VI), or on freckles and moles. 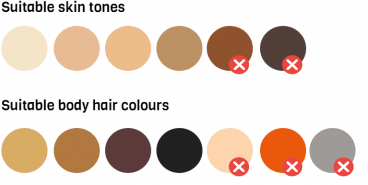 It won’t work on light blonde, red or grey / white hair colours. Is the Veet Infini’Silk good value? The Veet Infini’Silk has an attractive price at around $100 to $150. It comes with a 2.7 cm2 treatment window and 50,000 flashes. So you can treat a total body area of up to 135,000 cm². With that you can treat your full body (full legs, bikini line, underarms) around 30 times. That’s enough to cover your initial treatment regimen and around 2 years of top-up treatments. Each full body treatment will cost between $3 to $5. For small body areas (underarms, bikini line and forearms) you’ll get around 90 complete treatments, to last 5 years of use. Each complete treatment will cost from $1 to $1.50. 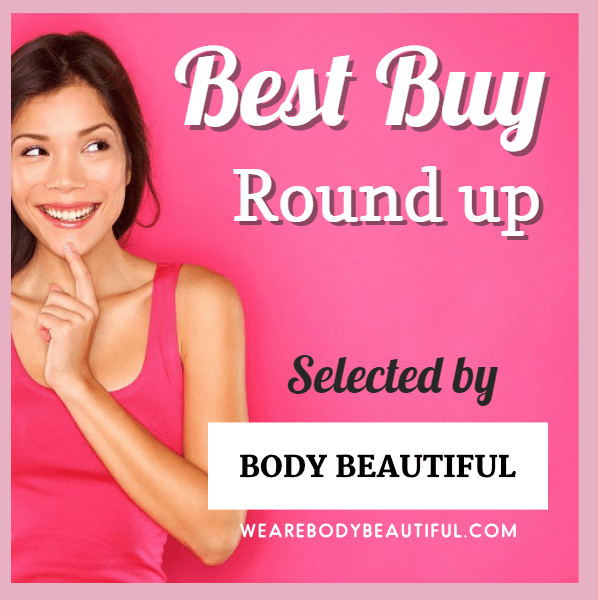 It’s a great value choice for small areas like underarms, bikini line and forearms. If you want it for your full body better choices are available a similar cost to give you more treatments. Also treatment times are slow with the Veet Infini’Silk on large areas like legs and quicker (albeit more expensive) alternatives are available too. N.B. the years of use is based on the bulb life only and doesn’t take into consideration general usage or wear and tear that effect how long the machine keeps working. The Veet Infini’Silk is manufactured by Silk’n and primarily available in the USA at the best prices. For those in the UK and Europe, the Silk’n Glide devices are available. Is the Veet Infini’Silk easy to use? It’s is a small, lightweight hand-held applicator that’s mains-powered, easy to operate, position and comfortable to use. It’s suitable for body only according to the user manual (however the matching European Silk’n Glide model is suitable for the face). First read the user manual to get a good understanding how everything works and what you need to do to be safe and get best results. Pay close attention to the list of warnings and safety precautions for important reasons not to use the device. For the skin test, shave first then after checking your skin with the skin tone sensor, simply start at the lowest level (1) and flash your skin. If that’s comfortable move up a level and repeat (on a different spot). Stop if it becomes uncomfortable or painful. Wait for 1 hour and if there’s no reaction continue with your treatment at the highest level that was comfortable. Do this for each body area you want to treat. The Veet Infini’Silk has a simple operation and it’s easy to get started. Shave first and make sure the area is clean, dry and free of lotions and deodorant. Set yourself up. You’ll need to be near a power socket. Try using an extension cable so you can choose the most comfortable area, like your bed, or close by to a mirror. Plug it in and simply press the power button to move up the levels and the indicator lights around the button show the selected level. A ‘ready’ light will flash when it’s in full contact with your skin, press the flash button. When you press the flash button the skin tone sensor checks your skin and will flash only it’s a suitable tone. When it flashes you’ll hear a ‘pop’ sound. A small safety sensor window next to the light exit window checks your skin tone at the start of and periodically throughout your session. It’ll only flash if your skin is in the suitable range. Your eyes are protected because sensors ensure the window is fully covered by your skin before it will flash. This means you can’t accidentally flash into open air. It has 2 standard treatment modes of stamping for a single flash (called Pulse) or continuous flashes (called Glide). For Pulse mode position the device on your skin, press and release the flash button. Then move to the next spot and repeat. It’s like a stamping action. For Glide mode position the device on your skin, press and hold the flash button. Keeping good contact, slide or skin the device slowly over your skin. Aim to get good coverage in time with the flashes. It’s more comfortable for treating larger areas, like legs (if you have the time and patience! – more on this below). How quick are the treatments? Let’s compare it to other devices and see how long it takes to treat a pair of underarms. The Veet Infini’Silk has a 2.7 cm² treatment window and it flashes every 1.5 to 3.5 seconds, dependent on the intensity level selected. To treat a pair of underarms (an area roughly 120 cm²) it’ll take from around 1:00 minute up to 2:20 minutes. The lowest intensity level (1) flashes every 1.5 seconds. The highest intensity level (5) flashes one every 3.5 seconds. Bear in mind that the higher intensity levels are more effective and you should use the highest that’s safe for you. This means fairly slow treatments if you can use the highest levels. Based on the equivalent Silk’n Glide models it takes 16 minutes per leg. That’s slow, so it’s not a great choice if you want to treat large areas like full legs, back, torso. It’s better suited for small areas such as the bikini line, forearms and underarms. These treatments will be quick and much more manageable. If you still aren’t sure, try my Best IPL and laser hair removal guide. These are the top devices available for home hair removal. All are tried and tested by myself and my small team of testers. Smoothskin Bare review; a game-changer?